Kyle Wiens, the CEO of iFixit, which cleverly uses product teardowns to make the company a household name among tech geeks. Last Thursday, iFixit’s CEO Kyle Wiens spent all day in San Francisco trying to buy the new fifth-generation iPod nano. It was the day after Steve Jobs introduced the new iPod, but none of Apple’s stores in the city had them. So that evening, Wiens sent iFixit’s summer intern on a red eye to the east coast with orders to buy one and immediately tear it apart. The intern’s teardown was reported all over, generating massive attention for iFixit. The next day, iFixit got a genuine scoop with a teardown of the new iPod Touch, which surprisingly doesn’t feature a camera. But iFixit’s dis-assembly revealed space for a camera. Apparently, the Touch was supposed to get one after all. Between the two teardowns, iFixit generated literally thousands of news stories — from Gizmodo to the Los Angeles Times. 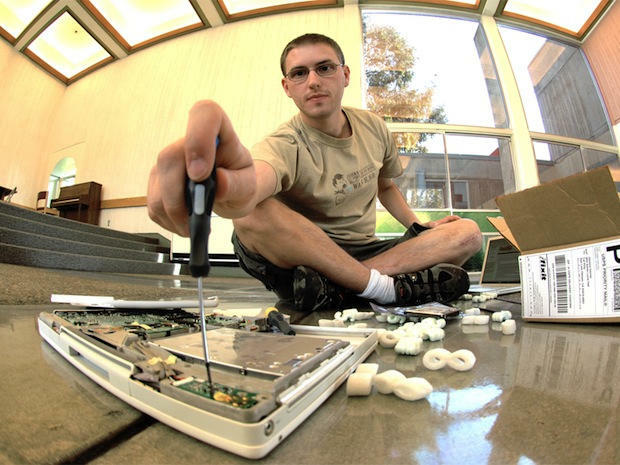 Not bad for little repair shop started by a pair of college students in San Louis Obispo, Calif.
iFixit makes its money by selling spare parts for Macs, iPods and iPhones. Its mission is to help people fix their own devices. It publishes free and easy-to-follow repair guides, but it gets the most attention for it’s superb product teardowns. This is internet marketing par excellence. Not only are the teardowns creating genuine news for the tech press, they are efficiently executed and beautifully documented. The photos are superb, and the walkthroughs are clear and informative. Best of all, Wiens is a genius at sending the media timely and informative emails about the teardowns that all but write the stories for reporters. My friend Brian Chen over at Wired.com has a great story today with a lot more detail about Wiens and his teardowns. Read it here.